Our fleet of over 30 box trucks trucks and tractors provides weekly scheduled tire collection with prompt and reliable service. If you think you business can benefit from consistent and regular scrap tire removal contact us today! We are also available on-call for tire pickups anytime you need us. To schedule a pickup call us at 508-997-8545 or use our convenient On-Site Pick Up Request online form. We have over 200 trailers and 400 roll off containers available for removal and transport to meet any scrap tire removal requirements. We are available to spot trailers on your site as well as transfer them to additional locations for unloading or storage. We offer complete site cleanups of any size. 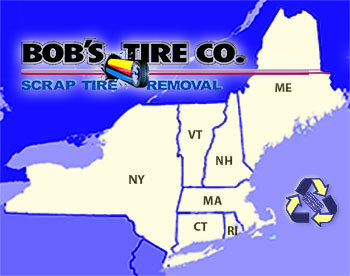 Bobs Tire Co. provides reliable and friendly scrap tire removal throughout all the New England states and New York. Or, drop off at our recycling facility located in New Bedford MA.